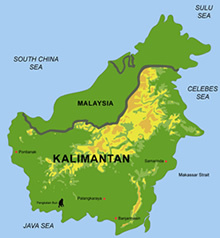 In recent years remote sensing im ages from space have become increasingly important in land use planning and large scale environmental monitoring, especially in Indonesia, which still possesses vast rain forest resources. 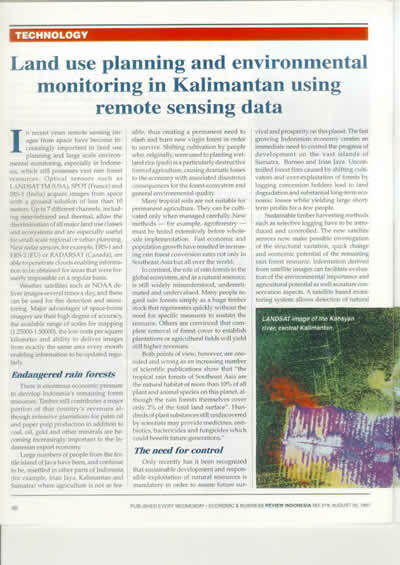 Optical sensors such as LANDSAT TM (USA), SPOT (France) and IRS-1 (India) acquire images from space with a ground solution of less than 10 meters. Up to 7 different channels, including near-infrared and thermal, allow the discrimination of all major land use classes and ecosystems and are especially useful for small-scale regional or urban planning. New radar sensors, for example, ERS-1 and ERS-2 (EU) or RADARSAT (Canada), are able to penetrate clouds enabling information to be obtained for areas that were formerly impossible on a regular basis. Weather satellites such as NOAA deliver images several times a day, and these can be used for fire detection and monitoring. Major advantages of space-borne imagery are their high degree of accuracy, the available range of scales for mapping (1:25,000 - 1:50,000), the low costs per square kilometer and ability to deliver images from exactly the same area every month enabling information to be updated regularly.